When it comes to haircuts in the military, many people think of military boot camp or basic training haircuts that are completed shaved for men and significantly shorter for women. This may be true for indoctrination training for basic military training, boot camps, Officer Candidate School, ROTC, and Service Academies' initial training, but after the first few months of training, members of the military may grow their hair to acceptable lengths. These lengths and dimensions are listed below and within the Air Force can be found in the Air Force Instruction (AFI) 36-2903. 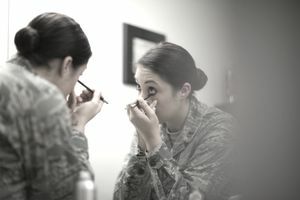 This military regulation not only discusses military grooming of active duty military members, but everything else from dress uniforms, working uniforms, casual attire, placement of badges, ribbons and medals, tattoo policy, and much more. Hair will be clean, well-groomed, and neat with only natural hair colors if dyed. Hair will not contain an excessive amount of grooming aids, touch eyebrows when groomed or protrude below the front band of properly worn headgear. EXCEPTION: Hair may be visible in front of women's flight cap. Hairnets may be worn as required for safety Made of cotton or a synthetic material; be of a conservative, solid color similar to the individual’s hair color, be strong enough to support and control hair; and contain no metal fasteners. Wigs and Hairpieces must be of good quality and fit properly. For males, Members must have their medical records documented to wear a wig or hairpiece to cover baldness or disfiguration. Other male personnel will not wear wigs or hairpieces. When worn, wigs and hairpieces must comply with the same grooming standards for natural hair. Wigs and hairpieces will not be worn by personnel engaged in flight line activities. Hair style will have a tapered appearance on both sides and back, both with and without headgear. A tapered appearance is one that when viewed from any angle outlines the individual’s hair so that it conforms to the shape of the head, curving inward to the natural termination point. Block cut permitted with tapered appearance. Hair will not be worn in an extreme or fad style or in such a way that exceeds length or bulk standards or violates safety requirements. Will not touch the ears and only closely cut or shaved hair on the back of the neck may touch the collar. Will not exceed 1 1/4 inches in bulk, regardless of length and not exceed 1/4 inch at the natural termination point. Will not contain or have any visible foreign items attached to it. Hair will be styled to present a professional appearance. Plain and conservative pins, combs, headbands, elastic bands, and barrettes similar to the individual’s hair color permitted to keep hair in place. Hair will not be worn in an extreme or fad style or violate safety requirements. Will not extend in length on all sides below an invisible line drawn a parallel to the ground at the bottom edge of the shirt collar at the back of the neck. Will not exceed 3 inches in bulk or prevent proper wear of headgear. Will not include hair ornaments such as ribbons or jeweled pins. Nail polish may be worn if it is conservative, single color, and in good taste. Nail polish will not contain any ornamentation. Cosmetics must be conservative and in good taste. For full regulations of the uniform and grooming standards, see the AFI 36-2903.